Over the last 5 years, numerous new manufacturers have sprung up with huge marketing budgets telling you how important it is to use their product in order to have healthy hens. So are they right? There was a lot of research done in the 1950’s and 60’s on vitamins for commercial laying flocks and thanks to this, we now understand the vitamin needs of chickens a little more. At times of stress: changes to their environment, returning from a show, introducing new chickens and so on can cause chickens to lose their appetite. During very cold weather: extra protein and vitamins are required to produce heat during the cold. 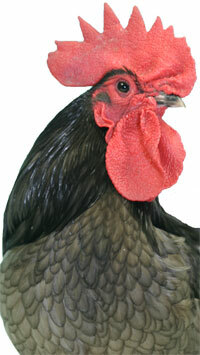 Breeding Chickens: Specialist breeders feeds are available which contain extra vitamins. Chicks and growers: have high nutritional needs. Multivitamins in the water are ideal for getting chicks off to a good start and helping them with the stress of moving accommodation as they grow. Poorly birds: If birds are stressed, their immune system suffers which opens them up to picking up a disease. Multivitamins are useful to help birds get through sickness. There are many different vitamin supplements available for chickens and some are very expensive. The more expensive products are also the ones that have big marketing budgets. Whilst I don’t doubt these products are very good for your birds, I would consider whether they really need this level of vitamin supplement when some people only use a basic supplement based on the fact that modern poultry feeds and fresh greens contain what is required. 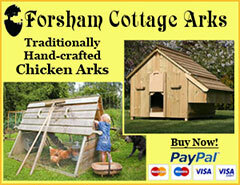 The cheapest way I have found to buy poultry vitamins is on-line. There is a good range of vitamin supplement, including some that won’t break the bank on this Amazon page. One or two vitamin supplements can usually be found for sale in pet shops and farm stores, however they are usually limited in what they stock and will often feature the more expensive products. 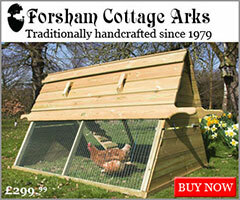 Do you have any advice on using vitamins for chickens? Please leave me a comment below. im worried about my blue ranger hen ive had her since 9th sept 2014 she is aged 16wks this morning i opened the coop where she lives with three sussex hens they walked out yet she wouldnt come out so i opened the roof to see her and her head was laying to oneside any ideas whats wrong please. The symptoms are that of a ‘sick chicken’ but I couldn’t tell you what it is, there are many diseases that could cause her to be off colour. I would take her to your vets or at least provide her with food and water near to where she wants to be and see if there is any change in 24 hours. I’ve just been reading the questions & answers on your web site on vitamins and noticed you mention about blood in poo, possibly being cocci. I noticed today in my chicken coop that there are droppings with blood in( I cleaned run 3 days ago and there wasn’t any then). 1st what does cocci mean? 2nd is this harmful to the chicken, the whole flock and to adults and children? 3rdly how do I Prevent and is it possible to cure? 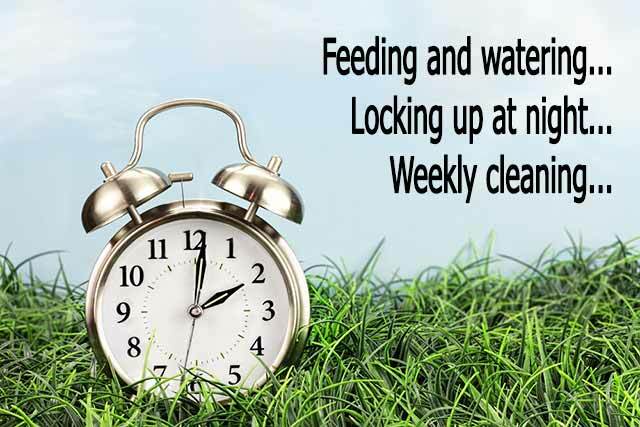 Coccidiosis normally effects young birds from 5 to 16 weeks of age. 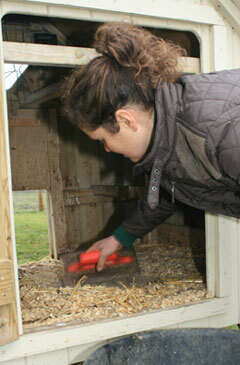 It can be very infectious and is prevented by keeping them on dry, clean bedding materials. 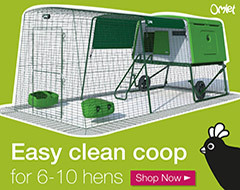 It’s beyond the scope of this site (aimed at beginners) so I would suggest you have a look at the article on Coccidiosis on the poultrykeeper.com site which is very good. Hi, I hope you can help. One of my silkies who is about 4 months old couldn’t stand up this morning. His legs are shaking and occasionally stretches right out and his toes curl up. He has no other symptoms, he is eating, drinking, alert but it’s very distressing seeing him laying on the floor. I’ve now bought him into the house in a box to stop the others pecking him. The Internet suggests it could be a bit imam deficiency? But I feed them good quality pellets and fresh fruit and veg and they free range most days. I don’t understand how this could happen. How do I give him vitamin b2 which is what I’ve read he needs but can’t find anything specific. Any ideas? Silkies commonly get Marek’s disease – by the sound of the symptoms (particularly the leg stretched out) I would suspect this. Wow! You REALLY reply with good detail, and reply to EVERYBODY’S QUESTIONS! I’m getting a chicken sometime soon, and Im referring to A MILLION SITES. What vitamins do YOU use specifically? And when you feed vitamins, where do you put them? AND , P.S WHAT CHICKEN FOR BEGINNERS DO YOU RECOMMEND? LIKE WHAT WAS *YOUR FIRST CHICKEN YOU BOUGHT/GOT*? I had a mixture of hybrid hens when I was growing up but these were really my parents. When I moved out of home, after University, I started keeping hens again and bought some more Hybrids – some Neras (Rhode Island Red X Barred Plymouth Rock) and Orpingtons. For beginners hybrids are a good start, they are easy to look after and are usually vaccinated. They lay lots of eggs and are friendly. I don’t use any if my hens are out on grass but they do have a large field with an electric fence around to roam into. If I have to keep them in or I separate some for breeding purposes or I have a sick bird then I will usually use Battles Poultry Drink. They all get fresh greens though. As for answering questions – it’s a pleasure to help people but I only log in every couple of weeks to answer them en-mass. We have a silkie cross hen that all of a sudden went down hill. Her legs were spread in either direction and toes curled up. I read about this Mareks disease and wondered if this was what she had. We have separated her from the others and in the past two weeks she has started to come back a little. She has sat up and now has her legs under her but toes still curled. She has been eating and drinking all this time so wondering if maybe she has something else going on. Any suggestions? It sounds like a nervous disease and yes, you are correct Marek’s disease is the most likely problem. It’s unlikely she will recover I’m afraid. I have loved chickens all my life and have just got my first chicks. Thank you so much for the information; it is very helpful. I’m glad to have found your site. Difficult question – true free range chickens will usually self medicate on pasture. 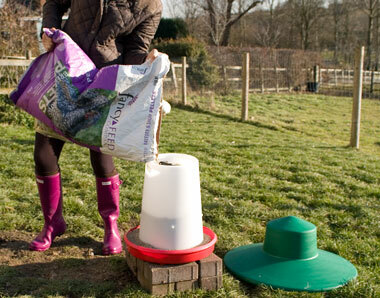 I tend to use them during winter, before the breeding season and if the birds ever look run down or sick. I’m worried about my young silkie hen she’s roughly 9 months old and started laying, she laid about 13 eggs before going broody and she’s been broody for weeks and every time she comes out she pecks and chases my other 2 silkie hens and I have no idea why ive tried to discipline her but nothing’s working I don’t know what to do? Silkie hens are notorious for being very good broody hens! This can be a pain if you don’t want them to be broody. Once broody, it takes a little while to ‘break’ a hen. They can have a very strong will. There are various methods, some kinder than others… but the first one I use is to hold her chest and feet in a bucket of cold water. Once the feathers are soaked, the hen will spend some time cleaning them up and drying off. Keep her locked out of the hen house or separated from the flock if they are laying. Sometimes, this is enough to cool her off and distract her, sometimes…. If not, I will resort to more drastic measures – I use a dog crate on a cold concrete floor in our garage. There should only be food and water in there, no nesting materials. Given 3-4 days in this environment is usually enough to break the behaviour. I don’t keep Silkie’s so I don’t know how strong the urge will be.. probably quite strong.